I adore this full skirt on Princess Charlene. I guess this is the royal edition of “On My Mind” since I was impressed over the past two weeks with the elegant and subtle styles from two royal ladies! 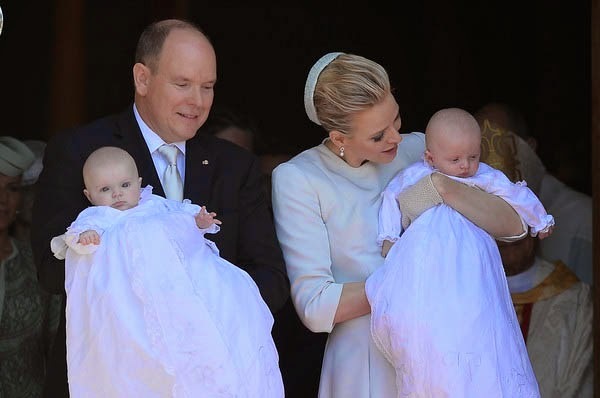 I thought Charlene looked so radiant, confident, and beautiful last Sunday at the baptism of her twins, Princess Gabriella and Prince Jacques. With her coloring I love her in pale shades anyway and I thought she looked stunning in the Dior ensemble that seemed the very palest of dove gray. I was especially enamored of her gray pillbox hat and those open-knit gloves. Perfection! I know that there have been many rumors of her unhappiness in Monaco but these pictures make me think that she is coming into her own and maybe not only finding her way, but making one that hasn’t been seen before in the principality. No one needs to compare her to Grace Kelly. With her Olympic background she is accomplished and gorgeous in her own right and I bet Grace—whose father and brother were both Olympians, as was her son—would agree! Charlene with her son, Prince Jacques. She looks gorgeous! Princess Gabriella in her father’s arms. Look at those eyes! I love all of Charlene’s accessories and jewelry. I love the back details of this entire ensemble. Has it already been almost two weeks since we all saw this picture? Kate and William with Charlotte, May 2, 2015. © PA photo. 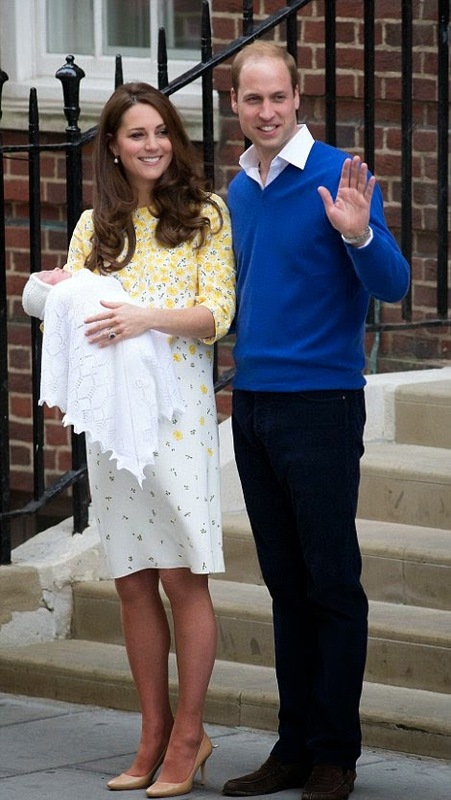 I couldn’t help noticing when Kate rolled out of that hospital on May 2, hours after giving birth and looking like a million dollars, that she had a lovely neutral manicure. 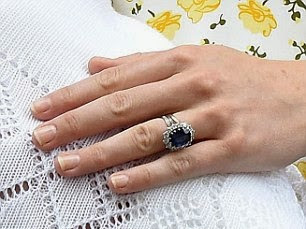 I don’t think of her as a big manicure gal since most pictures I see of her show nails with no polish, so it was wonderful to spy that big gorgeous sapphire and diamond engagement ring with two other smaller stacked rings paired with perfectly modern pale nails! A close of the manicure. Photo by Alan Davidson. I read over at the Daily Mail that Kate prefers pale polishes and they are one of my regular favorites too (the others being red or black). 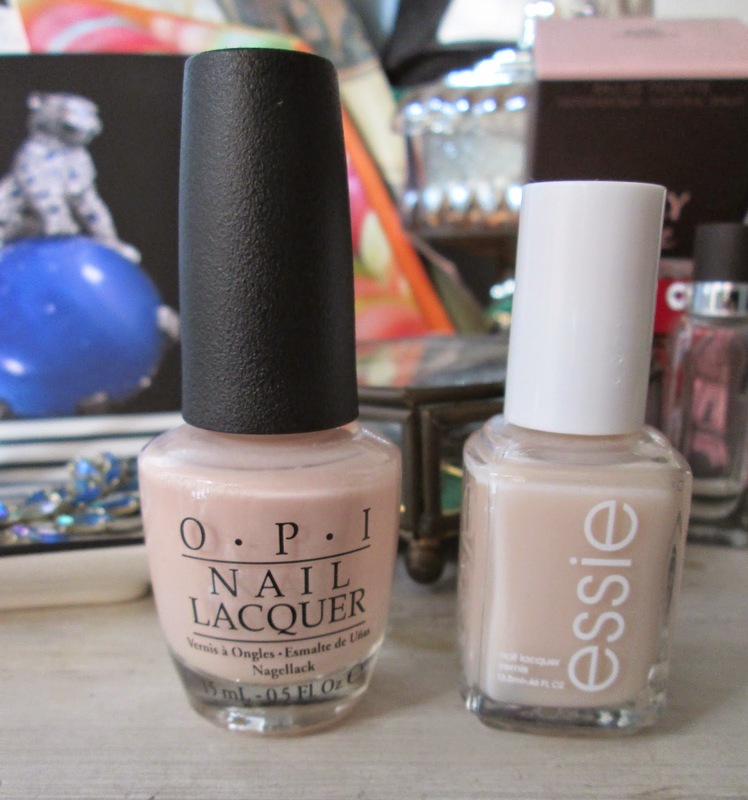 I think you can replicate Kate’s exact manicure with a mix of these two colors, one by OPI, the other by Essie. I swatched the colors at the end of a post I did in January, if you want to see them in action, but here they are in the bottle. Mimosas for Mr. & Mrs. by OPI, left, Mademoiselle by Essie, right. What do you think of pale skirt suits and pale manicures? What’s on your mind these days? I hope you have a lovely weekend! All photos of Princess Charlene and family are by Pascal Le Segretain/Getty Images Europe. I am getting my nails done next week...I just might do this...love how it looks. She is always so classy and it is fun she has a boy and a girl. Have a great weekend Jill! Love the whole Princess Charlene ensemble. Including that beautiful hat and those gloves. If this was centuries ago, you know the royals would be already talking possible marriage matchmaking between Prince George & Princess Gabriella. And probably Prince Jacques & Princess Charlotte. Hi Rosie! Oh you make me laugh, you are right of course, re the royal matchmaking, I had not even thought of that! It is going to be fun watching all 4 of these royal babies grow up. I thought the video of Gabriella and Jacques in the chapel was so adorable.